While the average American man stands at a respectable 5 foot 9, that barely holds a candle to the average NBA player, who comes in at a whopping 6 foot 7. That's not to say shorter players can't excel at basketball -- we saw 5-foot-9 Isaiah Thomas of the Boston Celtics put on a clinic this season -- but generally speaking, being tall will help you out in the NBA. Luckily for many, height is largely genetic, and several tall families have dominated professional basketball throughout its history. Arguably the most notable of these families (at least currently) is the Curry family. Father Dell Curry, measuring at 6 foot 4, played 16 seasons in the NBA. Eldest son Stephen (6 foot 3) has led his Golden State Warriors to their third straight Finals appearance, and younger son Seth (6 foot 2) plays for the Dallas Mavericks. 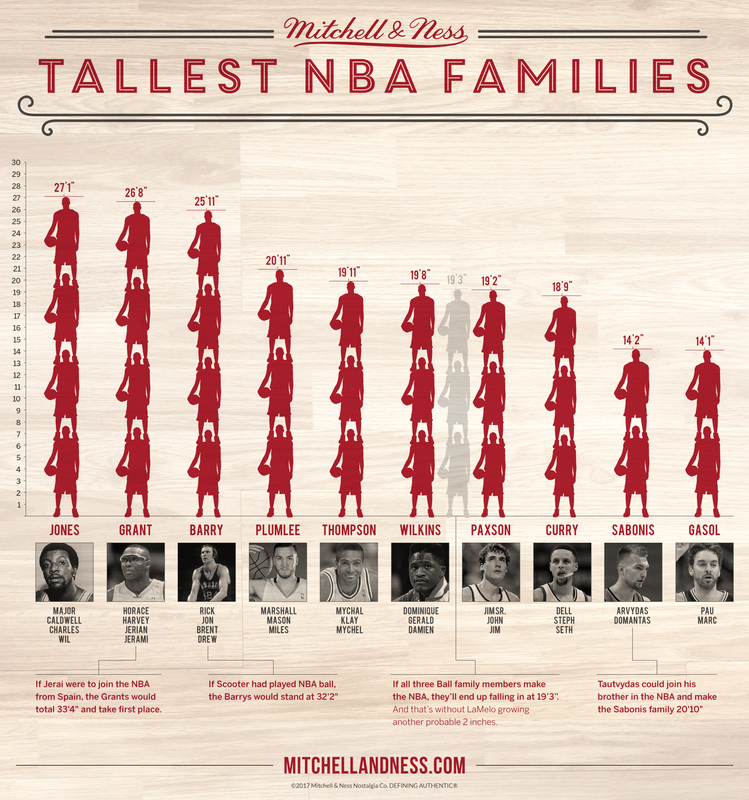 However, the Currys' total height of 18 feet, 9 inches only ranks them as the eighth tallest family in NBA history. The four Jones brothers -- Caldwell, Charles, Major and Wil -- take the cake for the tallest NBA family by a solid 5 inches over the Grant family of Horace, Harvey, Jerian and Jerami. Several families within the top 10 have an outlying member who could join the NBA and seriously shake up the rankings. Similarly, if Lonzo Ball and his two brothers are all drafted into the league, they would instantly join the list at No. 7.